We have just dropped the price on Guy's Biomech Tribal tee shirt, featuring his timeless mech style in a low-key black on grey look. 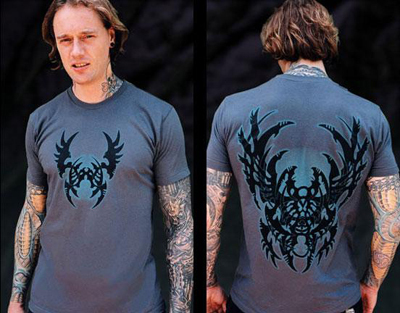 It's silkscreened on a high quality fitted shirt with designs on both front and back. Available in sizes M-2XL. This weekend it's our featured item, meaning not only free U.S. shipping on these shirts, but on any items ordered along with them. Drop by Hyperspacestudios.com to see the other cool wearable stuff in our catalog!